Jessica Rudder is a 2nd year Agricultural and Resource Economics PhD student at UC Davis. 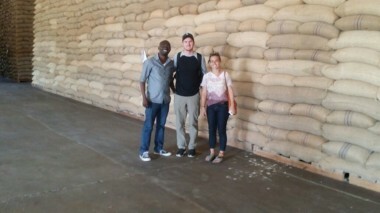 This past summer, with support from Development Impact Lab’s DIL Explore Grant and under the guidance of Professor Brian Dillon at the University of Washington, she traveled to Tanzania to conduct initial research on developing a tracking device for grain storage bags. This will allow farmers to measure and analyze grain movements between markets. The Tanzanian economy is heavily based on agriculture, and grains, such as maize, are some of the country’s largest food crops. We recently chatted with Jessica about her experience in Tanzania and its implications for the field of economics. 1. What is the Remote Tracking of Grains project and what compelled you to work on it? One of our goals with the Remote Tracking of Grains project was that we wanted to try out a more technical approach to monitoring economic data. To achieve that, we are exploring how we can attach GPS devices to maize grain bags in order to get a spatial mapping of how a bag flows throughout Tanzania. There is also a qualitative side to the research as well because we wanted a fuller picture of how the maize was traded. This laid the foundation for our research and as a result, we began speaking with many actors along the maize supply chain, such as farmers, small scale traders, wholesalers, government agencies, and transporters. 2. In your DIL Explore grant proposal you mentioned that the main questions you’re asking are: How quickly does grain flow between markets in response to arbitrage opportunities? Which rural areas are the major net food suppliers to urban areas? And, how far does the average kilogram of grain travel? Why is it important these questions are answered? There is an observed phenomenon where farmers sell maize grains during the harvest period (around June/July) During this period, the supply is most abundant and as a result, prices are at its lowest point in the year. A farmer could harvest and sell their maize grains immediately that price, or they can store it from one to six months to see how the maize grain price changes, as maize prices historically rises between 20% and 60% every year. By January of the following year, the price will have increased. Within that six month window, from June to January, farmers can decide when they want to sell, or if they want to store the grain for even longer. Prices are highest after that six month period, but it is also when farmers are in between seasons (or the lean season). During this lean season, there is not much grain movement in the market. So, there is a theory that maize goes back into the community. During June and July, when there is a lot of maize, and people need to get rid of the excess, the farmers become net sellers (since they sell more of something than they buy) of the maize grains, as they sell it to the market. The prices that they sell at is low. But then, six months later, after the market has shrunk, they are net importers (when farmers buy more from other farmers than they sell) again. (The prices they buy at is high.) You see this dynamic of sell-low and buy-high, which is considered a potential market failure (because the allocation of goods and services are not efficient) as farmers are given the worst prices in both cases. So it’s important to have these questions answered and pin down what those dynamics look like because in part, these dynamics are based on theory. There is some existing data, but we want to further expand upon that to determine whether households are net importers or net exporters of their grain. And through GPS tracking, we want to see objectively if we are able to track maize itself. Does it follow that flow that we anticipate? 3. The PI for this project is a professor from the University of Washington. Through your experience with this project, how has the cross-campus collaboration enhanced your PhD research? Was no one working on this topic at UC Davis? UC Davis is a place where there is a conglomeration of thinking around agriculture in general. While there is no UC Davis faculty on this project in this moment, as I move through my PhD program, I think more people will come onto this field. Before I started my PhD at UC Davis, I was a graduate student in a Master’s in public policy (MPP) program at the University of Washington. Professor Brian Dillon and I collaborated on another research of his in Tanzania over the previous two summers. This preexisting collaboration and our network of Tanzanian researchers allowed us to accomplish a lot in this project. Since I already knew the language, and we had colleagues there, it made the project very efficient, as we were able to leverage the networks we had built up. In addition, the previous two summers I had been in Tanzania, I had also been working on similar research, exploring the question of how farmers decide who to sell the maize to. 4. How has the DIL Explore grant helped you move your research forward? The whole process can feel like a simple transaction: when farmers grow something, they will just sell it. But the DIL Explore grant really gave me the opportunity to dive into the subject matter and think about all the economic transactions that take place in order to move food around the country. When I started to hone in on the specifics of the process and unfurled all of its layers, I gained a greater appreciation of how complex the dynamics of these economic systems were. It also helped me to zone in on specific questions and think about how I can model them or think of econometric approaches to identify some relationships. And not only that, the ability to travel to Tanzania allowed us to speak with a variety of people for our research and get a good picture for how the structure of these markets themselves affected the way that farmers and rural households interact with them. The DIL Explore grant has also really allowed us to approach this research question in an interdisciplinary way through collaborations from different fields of study. For example, I traveled with an engineering student from the University of Washington. It was a nice collaboration because his engineering background helped us to explore how we could program the device and think about the other engineering aspects, while I was there to lead on any economic questions. 5. What do you think is the long-term impact of your project? We know that price fluctuation affects households, and rural and poor households are affected disproportionately more than households that have consistent income sources. And so, some intervention or policy intervention are often put into place in order to smooth this inter-annual price variation. But when we think about putting policies in place, it’s important to also think about all the ways it will affect how farmers interact with markets. Having cheaper maize during the low season seems like a positive thing, but you have to counterbalance it with the potential effect of not being able to sell grains at a higher price, and farmers being impacted negatively as a result. Policies also have potential effects on the choices farmers make. For example, it reduces the choices that farmers have to sell their grains if the government purchaser becomes the primary source. Whenever policies are implemented, we have to think about all the ways policies will affect people’s lives in both the positive and the negative aspects. Hopefully, the research we are doing and our project will be a source that policy makers in areas where maize grain is a staple can pull from in order to pass the most effective policies. We learned a lot about the limitations about this particular approach to GPS tracking. We will need to interface with engineers and explore different ways we can adapt technology to this particular setting.